I Turned Away & She Was Gone was presented in Grahamstown by the National Arts Festival and Magnet Theatre. Directed by Mark Fleishman who also created the exceptional lighting design, the production features a superb and mind-blowing solo performance from Jennie Reznek who also wrote the piece. It is a reworking of the ancient Greek myth of Demeter and Persephone. The story goes that Demeter’s daughter Persephone was gathering flowers one day when she was captured by the god of the underworld. There was never any trace of her whereabouts or how she had disappeared. The set involves three baths and there is a strong focus on water, representing a volcanic pool or the mythical River Styx which borders Earth and the Underworld. This is a “drought-friendly production” as Reznek quips so there is very little actual water involved but I would imagine that it would be a highly dramatic water-drenched production in normal times! A screen takes us on the journey as we move between moods or characters. In this version of the myth, Persephone owns a holding in the Valley of 1000 Hills in KZN with a beautiful sculpted garden barely controlled by barbed wire fencing in need of repair. Demeter has been warned never to go through it. This is a powerful theatre piece involving choreography by Ina Wichterich where Reznek takes on the roles of Demeter, her mother and her grandmother. 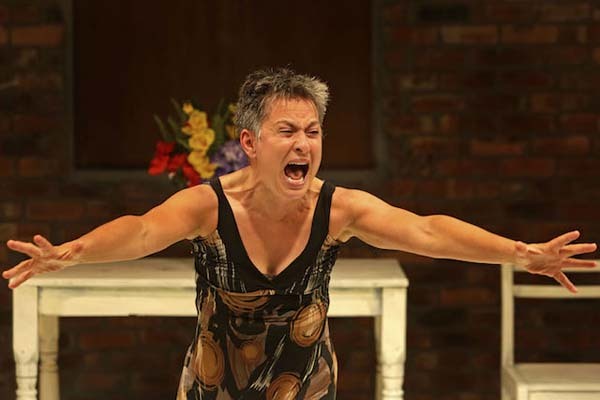 It is an excellent showcase of Reznek’s considerable versatility as the script requires her to handle a vast gamut of emotions from infinitely gentle or fiercely tender to bellowing with rage, frenzy and frustration.